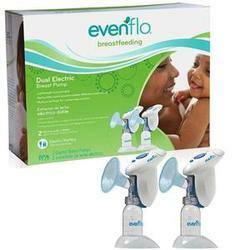 Evenflo Advanced Electric Dual Breast Pump Kit. PerfectlyPure™ closed system design helps protect pump and milk from mold and bacteria growth. AdvancedControl™ for ultimate personalization with 32 Independent speed & suction settings. AdvancedFit™ flange system includes 3 different sizes for maximum comfort. PerfectPosition™ angled flange design for slouch-free pumping. Includes access to Simply Breastfeeding™ and Breast Pumps & Briefcases™ educational programs. Contents: (1) Advanced Double Electric Breast Pump Unit, (2) 30.5mm Flange Kits, (2) 24.5mm Soft Flange Inserts, (2) 28.0 Soft Flange Inserts, (2) 5 fl. oz. Milk Storage Bottles, (1) Drawstring Wet Parts Bag, (1) Breastfeeding Guide Card Instructions to Access Simply Breastfeeding™ and Breast Pumps & Briefcases™ Programs, (1) AC Adapter, (2) Extra Valves and Membranes, Instructions for Use. Breast shields and Breast flanges are latex free.